Indesco was engaged to prepare the Stage 1 EDP (approx. 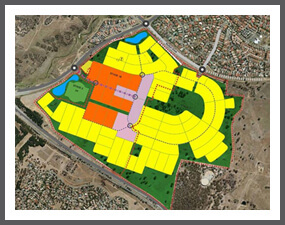 700 lots) and hydraulic masterplans for the Crace Residential Development. The project was accelerated from the original program for a May completion to meet the pre March 28 submission deadline for the changes to the Territory Plan. The company has subsequently been engaged to undertake the design and documentation of the estate entry road and stage 1B and 1C, the residential component comprising approximately 430 blocks and four superlots.